Although the principle of most stews are generally all pretty similar, they can have very different flavours and this one is not exception. I can honeslt say that it is a unique taste and I have never tasted anything like it. I do love trying new things and experimenting and to make something like this that was unlike anything that I have attempted before, was a great adventure. 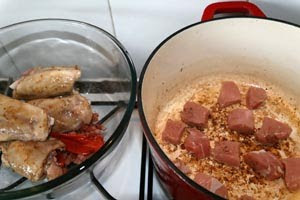 Unfortunately I really had no idea where to get rabbit, so I ended up using chicken and pork, which I would hardly call adventurous. Regardless this culinary foray into the unknown was nonetheless distinctive in flavour. I don’t know what it is about the recipe that makes it so different. Maybe it is the lack of herb, maybe the vinegar which i rarely use, but whatever it was it was an education to my palate. being of South African origin, and having lived in New Zealand and now Manchester, England, I have never, ever made anything that is from the South-Eastern of the US of A. When I was reading about the origins of the dish, I was fascinated by the 2 possible origins for the original and first ever Brunswick Stew. We may never know where exactly it came from but I know where its going, into my recipe book for future use. In a very TV-chef like fasion I tried to be very organised with this recipe and prepped all my ingredients before-hand and put them into cute little bowls for ease and speed of constructing the final dish. 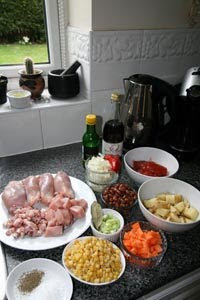 It takes some time but it does make the cooking process much simpler and easier by doing all the prep ahead. I may work like this more often from now on. 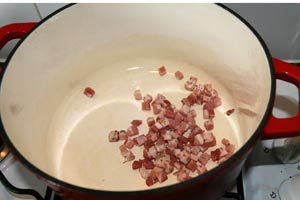 I did use pancetta in the recipe instead of the specified slab bacon as I could not find slab bacon on my shoppint trip and I thought pancetta would suffice, and it certainly did. My only other variatios were using pork instead of rabbit and using Adzuki beans instead of butterbeans. Although i would love to try cooking with it I did not know where to buy rabbit, and I’ve never been a huge fan of butterbeans so I used what I had in the cupboard. 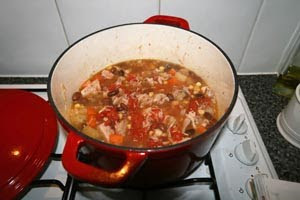 The stew did take some time to make but it is a nice Sunday afternoon endeavour and the finished result tasted fabulous. Its also so verstaile that you could tweak and change it as you like to suite your taste. A definite keeper! Now bring on the next Daring Cooks Challenge!